Leather jackets are unquestionably some of the finest leather products you can buy. With so many different leathers, colors, fits, and styles, leather jackets singularly bring the most to the table in terms of personal fashion. When BestLeather heard about Alpha Industries and visited their wild booth at Fashion Week, we were beyond excited. At their booth we were given the chance to explain our reviewing process, and on the spot, Alpha Industries chose to set up a review of their MA-1 Flight jacket. Alpha Industries is a company surrounded by heritage and tradition. 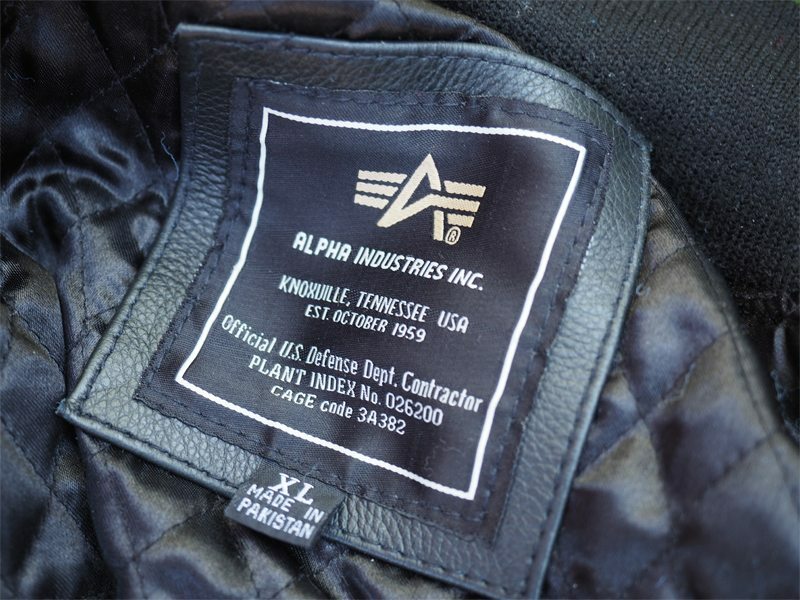 Founded by Samuel Gelber to provide quality clothing to U.S. Armed Forces, Alpha Industries began as a small, 35-employee government contractor. Each product they make has an equally fascinating story to go along with it, so when you buy an Alpha Industries product, you really are getting a quality heirloom product. 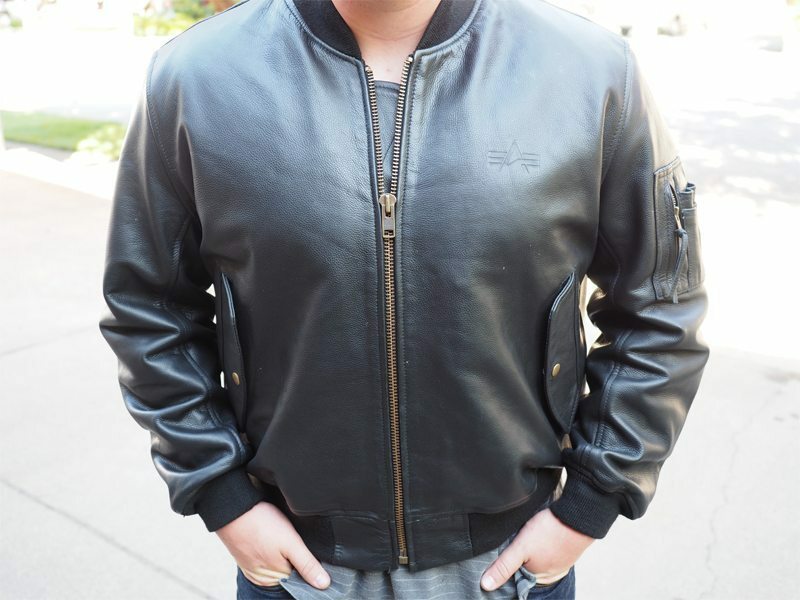 Today, this iconic company is a globally recognized leather and flight jacket forerunner. Because I could write for pages about Alpha Industries rich history, I’ll let you go ahead and play around with this famous company’s interactive timeline. Check it out here. The MA-1 Flight Jacket is constructed using 100% real full-grain leather. It is immediately obvious that the leather on this military aviator jacket is high quality. The beautiful YKK antique brass hardware and zipper provide a refreshing contrast to its all black military attitude and the inside is lined with a diamond patterned polyester quilted lining. The diamond patterned lining is comfortable enough to wear in most temperatures. On the outside, Alpha Industries has added a personal flair with their signature utility pocket, giving ample storage for several EDC items you want with you. The waistband and cuffs are made from heavy-duty 100% wool. Each seam on this jacket is expertly united, providing an extremely durable, comfortable impression. The skillful construction of the MA-1 Flight Jacket is one of my favorite features because it demonstrates that this jacket will last a very long time. I have taken this jacket everywhere. I take it on long motorcycle rides, to college classes, skydiving, weekend getaways, and I have even used it to go flying. Each time, without a doubt, someone has commented on the quality of my jacket. Every place I took the MA-1 Flight Jacket, especially flying, I realized just how well it functions. I am never too hot or cold because of the quilted lining, and I always feel pleased with this piece upon taking it off. I have begun to entertain a reputation of “the guy with all the leather” simply because my typical get-up is a leather jacket, leather briefcase or messenger, leather wallet, and leather shoes. It is quite a fun fashion statement to entertain. The MA-1 Flight Jacket is a classic aviator jacket with a refreshing, modern touch. The MA-1 Flight jacket comes in two colors, brown and black. Each color changes the whole statement of the jacket. Brown offers you the classic, vintage aviation jacket, while black causes an edgier and more modern look. Both colors are definitely a solid choice depending on your style. As I said earlier, the MA-1 is a great jacket in most temperatures. I can wear it all day riding my motorcycle, and continue to wear it for the cooler afternoons. The softness of the leather allows adequate flexibility and motion enough for me to safely fly planes and ride motorcycles. Overall I have been extremely pleased with how this jacket has performed, and am eager to see how it ages. 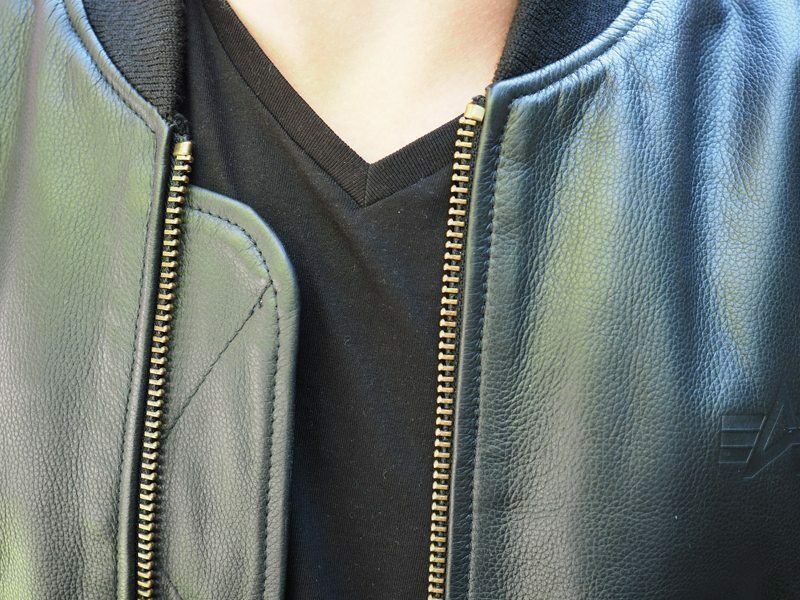 Every fashionable man needs a good leather jacket in his wardrobe. If you are looking to make a statement and harken back to the leather loving armed forces of the day, the Alpha Industries MA-1 Leather Flight Jacket is an appropriate choice. In terms of leather jackets, the wise investment of $365 for this leather jacket will be a perfect addition to your style. Head over to Alpha Industries great website and see all the different styles they offer. We will be reviewing their G-1 Leather jacket shortly, so stay tuned. 3 Comments on "Alpha Industries MA-1 Flight Jacket Review – $365"